....... with grille and headlight surrounds & replacement bumper with integrated LED spotlights. Available for 90's and 110's, with matching rear door glass including wiper and heated defrost. We are custom Land Rover Defender Builders. If your Defender needs major works, or a ground up rebuild or restoration, we can help. We build and sell specialist 90 & 110 projects. Please let us know if you have anything specific in mind and we can build to your bespoke requirements. If you have lived with a totally standard, aging Land Rover Defender, you will I hope understand why we set out to create a custom defender? It was due entirely to necessity and the need to make a more useable and reliable Defender. My partner already owned a 1996 TDi when I met her. It was used for towing a horse box… when it worked, which wasn’t very often! It has a standard factory issue earth wiring fault meaning that 24 hours after using it, the battery was flat and it needed jump starting. This irritated me hugely, and led to it being used as less and less. I am 6′ 2″ which was my second big issue with a standard defender 90. The evolution of man during the last 70 years or so, in the western world at least has resulted in our average height increasing from around 5′ 6″ to 5′ 11″. This is a massive increase in a short period of time, and for other car manufacturers has never been an issue as their model ranges only exist for 6 – 8 years on average. When a car stays in production using the same core components for 70 years however, changes in the average size of occupants becomes much more noticeable. Thankfully I’m not broad, but still, sitting in comfort was not possible with the standard leg room available. The original plan was to make our defender useable, while tidying her up in the process. However, I soon learnt that as soon as you fix whatever it is that irritates you the most on a defender, you soon become focused on the next irritant and want to fix that too. We were keen to customise our Land Rover so that it not only worked, but looked great too. I am not a fan of a lot of the aftermarket accessories that are available, especially the huge range of checkerplate that is so often used to hide body rot & panel damage. 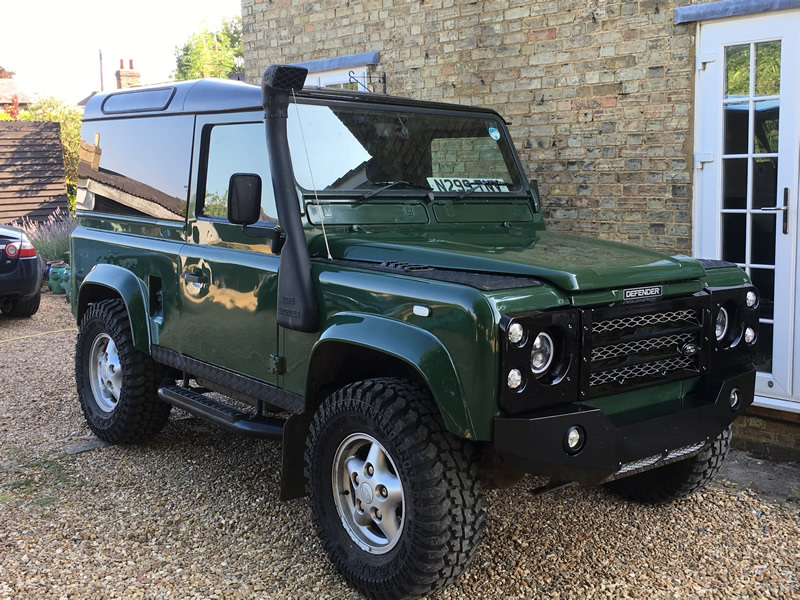 I first toyed with the idea of a galvanised chassis, but our Defender is rust free so instead directed our budget at useability, and function, rather than rebuilding from the ground up just for the sake of it. Identifying a Defender earth leak is a lifetimes work and let’s face it, life is too short to to replace the loom and every electrical component on the truck. Instead, we opted to accept her shortcomings and fitted a battery isolator switch. Ever since she has started first time on the key without a problem, even after standing for a month or two unused. Problem solved. My next big irritant was the lack of legroom. Back in the 1940’s Britons were much smaller than we are now. Average heights have shot up and the driving seat of a Defender is the best place to illustrate this. Driving any distance was quite uncomfortable, so I set about looking for solutions. Removing the bulkhead so the front seats are free to move back further is the only practical solution. On any aging vehicle, one of the first areas to suffer the ravages of time is the wiring. Terminals tend to corrode and as a result, lights stop working and before long you will grow tired of tapping them or stripping them down to clean up the contact points. LED replacement lighting solves all these issues as well as providing lighting that is powerful enough to let you see where you are going! Lights have always been a weak point on Defenders, but it doesn’t have to remain so. There is a reason why you will often see older Defenders adorned with more lights than a Christmas tree….. it’s normally in the hope that at any point in time, some of them will be working! Over time, LandRover suspension becomes tired and lazy. Thankfully there is a huge range of upgrade options available to choose from, whether you want to retain standard suspension or upgrade with heavy duty, raiser kits, enhanced performance etc. Standard Defender steering has long been a source of humour. The relationship between the steering wheel and the front wheels is often not much more than a nodding acquaintance. Excessive play in steering is almost a factory fitted setting, but it doesn’t have to be like that! Aluminium doesn’t rust…. hurrah! But….. it does corrode over time which is another word for “rust”. The consequences are the same, regardless of the chemical process that takes place. Bubbled paint work, blown paint on the bottom of doors and commonly around the lower part of body panels. The low cost solution is to bolt checker plate over the top and you can even buy complete kits for just this purpose, but it looks cheap and is a short term bodge. Panels for Defenders are actually quite cheap (although prices are rising) and fitting new panels isn’t as difficult as it is on most other vehicles. Clean, corrosion free paintwork will make your Defender look a million dollars. Your Defender, exactly how you want it; looking awesome, working efficiently, and without all of the shortcomings that compromise Defender ownership.